Tips for the One iPad Classroom, and a Free iPad Rules Download! Do you have an iPad in your classroom? Are you wondering how you can make use of it when there is only one device for all of your students to share? Well, never fear, I have tons of ideas for you right here, and a "Rules for the iPad" free download, too! And for those of you that may be new to my blog, this post focuses on using the iPad in the young children's classroom, such as Pre-K, Kindergarten, First Grade, etc. Before you get started using the iPad in any manner, make your expectations on how to use the device clear. Here are my rules for the iPad. Carry the iPad with two hands. Sit down while using the iPad. Hold the iPad from the base, not the cover. No banging, slamming, or hitting the iPad. Share nicely and stop when your turn is over. I made a poster for the rules with picture cues to help the children, and I am sharing it with you here today! Click here to download it in two sizes; one is 8.5 x 11″ and the other is poster size! It prints in four different sheets. Just glue them down on a poster board and laminate them. Be sure that you physically demonstrate how to share the tablet. Then have some children in your class model that skill for the others. (Just telling them to share is not enough!) My favorite technique is to pick my two children that seem the least likely to share nicely to show the others how we share. First I show them, and then they model it for the class. This establishes that we all know that these children understand how to share the device. Therefore, if problems arise later, they can’t claim that they didn’t know. Sand timers make it easy for little ones to share. 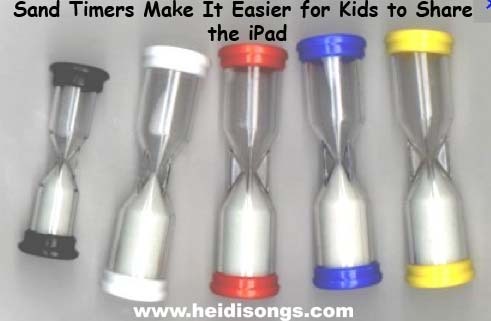 When the sand runs out, it is another child’s turn to “push the buttons.” BUT- when using a one minute sand timer, don’t let them change apps, or they will spend their whole 60 seconds choosing an app and opening it. Then the sand will run out before they have had a chance to play it, leading to frustration. That’s when they won’t give up their turn with the timer runs out! Sharing the iPad on the “Fish School” app by Duck Duck Moose. A different way to share the iPad is to teach them to take turns pressing the “buttons.” First child one presses it, then child two; then child one, then child two, etc. That way, nobody has to wait for a very long time to play. 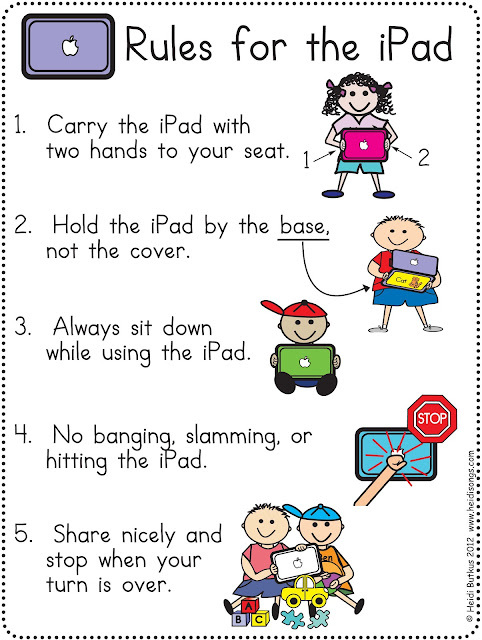 Here are some ways to use the iPad in a classroom where there is just ONE, and many children. 1. Use it as a motivational device. * Tell children that when they master a certain skill, they will get a chance to play a favorite game on the iPad for a few minutes. The iPad can be a powerful motivator! I have had some children try very hard to learn how to write numbers once they realized that there was a reward that they really cared about waiting for them! * Use it as a reward for a child with behavior issues. “Make a deal” with the child ahead of time that the child will meet a behavior goal in exchange for time on the iPad. * Let a child that has finished his work quickly spend time on the iPad. You wouldn’t believe how quickly and beautifully my students were able to work last year with the lure of the iPad on the table. If the work looks rushed or sloppy, the child must fix it before getting a chance to play. 2. Use it for differentiating instruction. * For small group instruction: Let an advanced child that has mastered a skill that you are working on in a small group work on the iPad instead of doing that small group lesson. 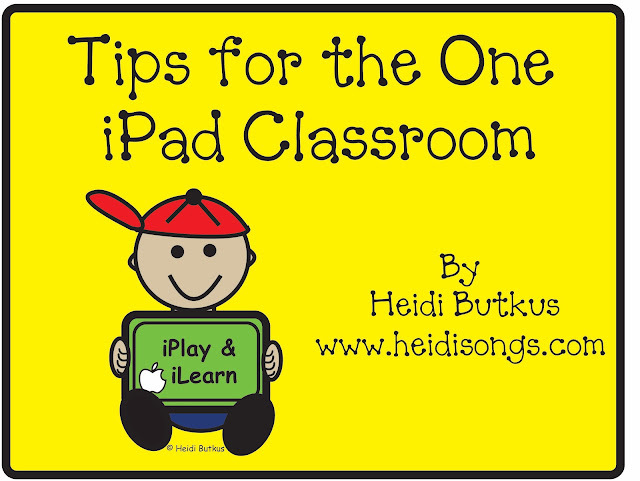 Even Kindergartners and preschoolers can be taught to share the iPad without intervention, with a little practice! * For large group instruction: Use it to occupy a child that is continually giving away answers during a whole group lesson. Send that advanced child to work on the iPad, and give him or her headphones. That will give the rest of the class some “think time” and a chance to answer your questions without the class “smarty pants” always giving it all away. 3. Give children one-on-one time on the iPad. * Use volunteers to monitor this, or send children to work on it for five minutes at a time, setting a timer to help you remember to rotate them. Don’t you just love those chubby little hands???? 4. Use the iPad to give online quizzes, such as Accelerated Reader tests. * Consider allowing those that get 100% on a test to take their next quiz on the iPad. * Consider giving those that get 100% on a test the reward of alone time on the iPad. 5. Use the iPad for a Listening Center, setting up recordings of books in iTunes. You will need a headphone adapter/splitter if you want the children to all share the one device. For more information on how to use iTunes for a listening center, click here. 6. Let an iPad app to form the basis for a small group lesson. Let the children take turns pressing the buttons. Example: We used the app Park Math by Duck, Duck, Moose to show the children some problem solving questions in math. The app showed an animation of the problem and then the children chose one answer from the list. The children wrote their answers on white boards, and then one child pressed the button to find out who was right or wrong. 7. Pair your iPad with a projector and a VGA adapter ($29). * Let the whole class watch you demonstrate an app or do a lesson based on an app. * Web based lessons can also be done on the iPad. Consider using YouTube or SchoolTube video lessons. Google Earth is also a great resource. 8. Make a movie of a child reading. * Children can read back their own writing assignments, or an assigned book. Kids often will work very hard to get a story “just right,” and may request to practice reading it again so that they can re-do their recording and “get it right.” This is even true of those movies that may NEVER be shown again! It’s a great motivator to increase fluency. * Have older children make a movie of themselves reading a book for a younger class to use in a listening center. 9. Let one child at a time create his or her story on the iPad rather than on paper. * Storybuddy 2 is a nice primary app for this purpose. * Kids can also rotate through to do journal entries on the iPad. 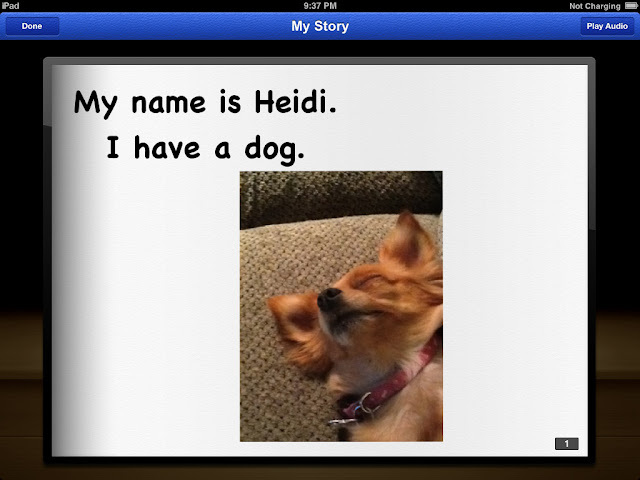 The Storybuddy 2 app allows you to add photos and text to make a simple story. 10. 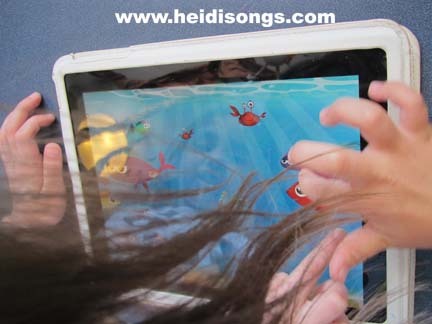 Rotate kids through using the iPad during playtime. * Just keep a list so that everyone gets a turn. Make it a rule that the other kids cannot spend their playtime just sitting there watching, though! They need to go play. 11. Choose one child at a time to use the iPad as a dry erase board. 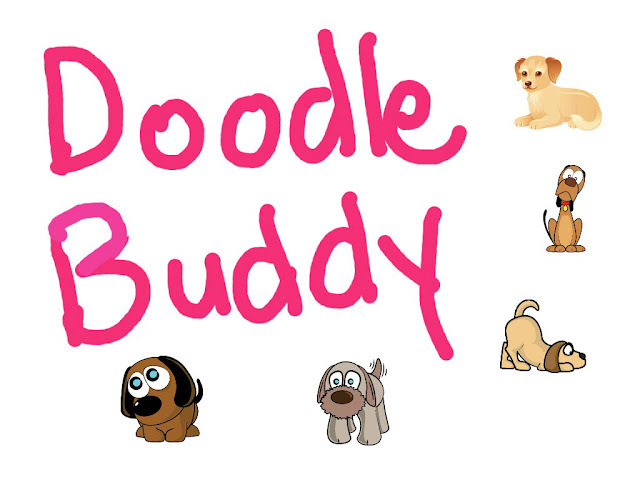 * Doodle Buddy is a nice app for this purpose. 12. Use the “Stick Pick” app to randomly choose students to respond to questions. * This is just like picking a stick with a child’s name on it, but it’s on the iPad. 13. Use the iPad for classroom management and documentation. * ClassDojo.com is a website that helps you document student behavior and participation easily. It can even generate behavior reports that you can send to parents. Use any mobile device to input data. 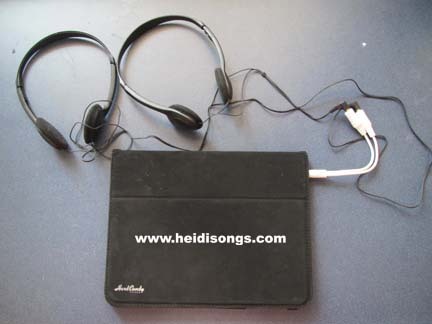 * A headphone splitter will allow two children to listen to one iPad. 14. Create a Collaborative Story. * Many apps lend themselves to creating a story as a group. Sock Puppets is one of these. You choose puppets, backgrounds, settings, etc., and then make your puppets talk by talking into the microphone yourself. The puppets’ mouths sync themselves with your voice so that it looks like they are talking! * Puppetpals and Toontastic are similar story telling apps. * ComicStrip is an app that allows you to make a comic book out of your own photos by adding speech bubbles and other text boxes. Stories can be emailed, too. THIS IS AMAZING!!!! Thank you so much, Heidi! Love these ideas!!!! I can't wait to put up the iPad rules. I am going to let my kids start using it next week! Thanks for the rules. I'm piloting the use of 4 ipads in my kindergarten room this year. I will be using for small group instruction as well as free time during center time and you have just provided lots of resources for me! I can't wait to try the ipads out...still waiting on the tech department to get everything set up! Great rules and ideas for 'sharing' the classroom tablet. Thanks for posting. kindergarten teachers (we are always last!) just got one i pad per classroom this year. we were given a "speed learning" inservice that is now buried in my brain somewhere considering all the other new information we are all given at the beginning of school! so i was wanting to use it but too afraid i didn't know enough about it to even feel comfortable with letting kids touch it. this will help me get over that ipad fear factor. I love everything you do...but i think my favorite things to love about you is your 'common sense' approach to teaching...and your candor about everything we do. I love the iPad rules! Thanks for sharing. I have not introduced the iPad yet this year, but this makes me want to do it tomorrow :). I am crossing my fingers (and toes) that my mini-grant has been approved for an iPad for my classroom. I love your rules and proceedures. Kids will feel so proud and important to use them while diving into a whole new level of learning! Oh, I hope I get an iPad so I can use your way cute ideas!!! I am crossing my fingers (and toes) hoping that my mini-grant is approved for an iPad for my classroom. My students will feel so important and proud to use the iPad rules while diving into a whole new level of exciting learning! Oh, I hope I get an iPad, especially now. This is so awesome! I love this. Thanks for sharing. I enjoyed reading your blog. The rules and ideas for integrating an iPad in the classroom are very helpful, especially because this is a new tool being integrated at my school this year. The links to other posts were very helpful as well. You make using an iPad in the classroom sound very easy, even though some may be afraid to try it. I am an IT Specialists in Texas. My team is presenting on the 1 iPad classroom at TCEA in February. Would you allow us to show your rules poster during our presentation. We will, of course, give you credit. Your information is extremely useful for my schools. I am an IT Specialist outside of Dallas. My team is presenting at TCEA in February. Would you allow us to use your rules page - of course, we will give credit to you and point people to your blog. You may certainly share a picture of it, and you may tell people that it is here on my blog. But please have people visit my blog to download it. 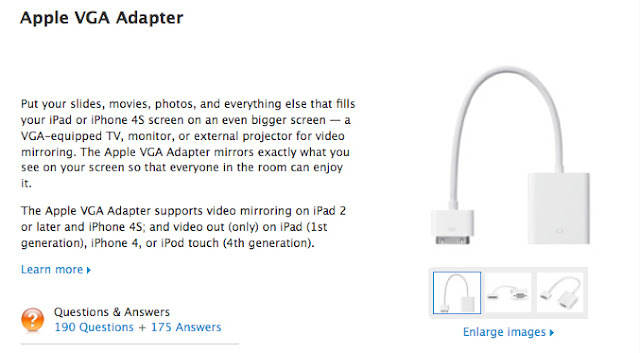 Heidi, do you have any additional tips for hooking up the iPad via VGA adapter to a projector? I purchased the VGA cord and tried to hook it up today but with no luck. I'm not sure if I hooked it up incorrectly or if the cord is malfunctioning. Thanks for all of the great ideas for iPad! All I do when I hook it up is connect the VGA adapter to the LCD projector (not the computer.) Then make sure your iPad is on, of course. Mine projects what is on the iPad screen immediately, unless it falls asleep. If the iPad falls asleep, then the screen goes blank. If you are still having trouble, I would do a "live chat" with someone on the Apple website and have them walk you through it to make sure you are not missing something. If your adapter is not working properly, they will know. Thank you so much for the suggestions! We just got extra Ipads in second grade for center work and I have gone to town tonight downloading apps that my kids can use! LOVE the rules!! I downloaded it but am not able to print it on 1 page only given the poster option.... Is it because I have a mac?? Could you email me just the 8.5 X 11? I just downloaded it, and the first page of the download is the rules on one page, and the rest is the rules poster split into four pages. If you can print the one, you should be able to print all of it! But I will be happy to send it to you! Love these great, practical tips. Could you send me your email address instead of your Twitter address? I would rather send it to you your email address. Thanks Heidi for sharing such and incredible resource! I train teachers to use iPads for grades K-12. 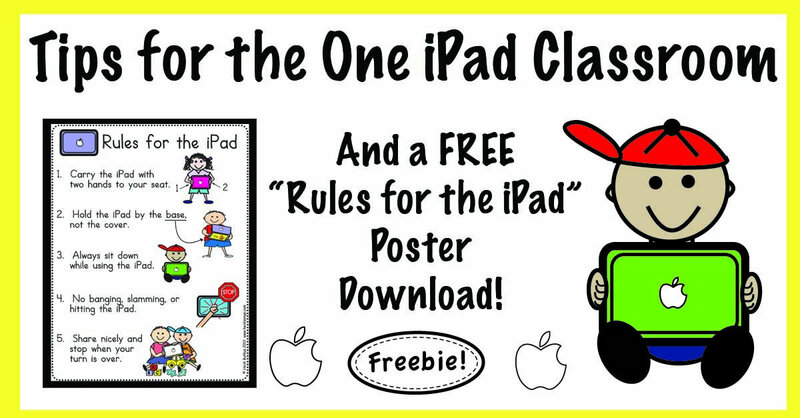 I can't wait to share your strategies for using the iPad in the classroom and the free iPad Rules chart! Thank you! Just please send them here to my blog to get the free download rather than distribute it yourself, okay?